Everyone keeps on blaming Lindsay Lohan and Britney Spears for their crazy ways. They (allegedly) having drinking and drug problems. I don’t blame them. However, everyone keeps on looking past one common thread: Promises Rehab. 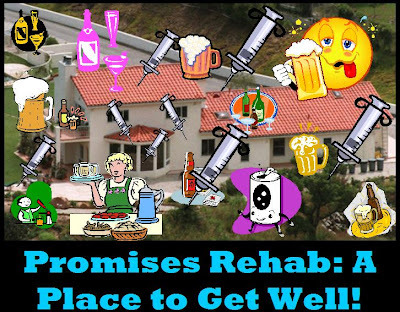 What in the hell goes on at Promises Rehab? Whatever it is that they do there, it doesn’t seem to be working. As opposed to writing an open letter to Dina, Lindsay, or Michael Lohan – I’ve decided to write an open letter to a building; Promises Rehab. How are you? I’m fine. What’s new? N/M/H. I have a quick question for you, Promises. What the hell takes place at your facility? I always thought it was a rehab facility, but now I kind of think it’s just a club. I feel like it’s Hyde 2.0. Is your “club” a place for celebrities to drink and do lines of coke off of a public toilet? Whatever you do there to help doesn’t seem to be working. In fact, it seems to make these celebrities worse. Maybe your facility shouldn’t be so nice and “ritzy.” Maybe Lindsay doesn’t need to play tennis on your property and be allowed to go out to the gym 6 times a day. Maybe, just maybe, you should be strapping people to their beds and force them to listen to the entire soundtrack of “The Bodyguard” until the alcohol and drugs run from their systems. The only downfall of this method is that they may develop and unhealthy hatred for Whitney Houston, but that’s a whole different issue. Anyway, Promises, do you have a free one-day pass that you could provide me? I kinda want to check it out. It looks like a blast.